Ah, Halloween...a time for trick or treat, and the Great Pumpkin (if you're a Charlie Brown fan, that is). But did you know that the origins of Halloween are Irish? Saimhan was, however, not only an end but a beginning... It was the end of one year, and the start of the New. So it was a time for new beginnings, and new journeys. To this day, the Irish celebrate Halloween a little differently than the American version of the holiday...and to be frank, it can be much more fun. When I first came here in 1992, pumpkins weren't readily available. 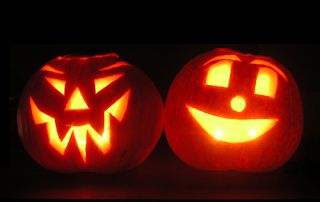 But I'd go out of my way to order one, ensuring that I could carve my jack-o-lantern just as I had in the States. Mind you, the neighbours probably thought I was crazy! They never carved Pumpkins. Instead, they carved out the innards of a Turnip. Have you ever tried making a jack-o-lantern out of a turnip? It's hard work! But the Irish had - and continue to have - many other traditions that at the time were somewhat foreign to me. For instance, they would always serve a Halloween Brack, a tasty dense cake of raisins and fruits. Buried within would be a ring. The person who was served that ring was bound to be married in the coming year - and hence a new journey would begin! Ghost stories are always part of the night, and bound to send a shiver up children's spines. My father-in-law loved to tell the story of the Banshee. He was convinced that he had heard the howl of the Banshee years earlier, upon the death of a friend, and he told that tale so convincingly that many of us could swear that we, too, could hear the Banshee's wail. But it was the Bonfire that always proved to be central to an Irish Halloween. For months, the local kids gather together anything that might burn - tires, old pallets, beds and bedding - and pile them in the center of a local park. On Halloween night, those mountainous piles of jetsom are transformed into huge burning pyres of light, diffusing the darkness of the night for hours on end. At the same time, fireworks are lit, lighting the skies with rocket's red glare. And - if you're lucky - a full Halloween moon floats above it all, casting the Irish world in a glow of creepy glory. Today, Halloween has changed a bit. Irish kids trick or treat, just like they do in the States. Bonfires and fireworks aren't as commonplace due to Global Warming legislation. But many still tell ghost stories, and usher in the new year of light with a fragrant Brack that sends people away toward new journeys. And somewhere, I suspect that the Old Irish are involved in a ghostly celebration of Samhain, perhaps drinking a mug of Poitin in order to celebrate the end of an old year, and the beginning of the new. For more stories on living in Ireland, why not buy Tom Richards' book, A Survivor's Guide to Living in Ireland? Click for more details! Ha ha, I remember carving turnips when I was a nipper in Scotland. My American wife thought that was the most ridiculous thing she had ever heard when I blurted it out one day. Great story, as always. Did not know about the "Irish connection" with Halloween. Sounds like great fun... too bad there has been a reduction in bonfires and fireworks. I often think that governments worldwide get carried away with legislation like this. Oh that is really cool! Sounds like in Ireland you guys sure have a lot of fun!